05 Apr 2019 --- Food pantry clients are more likely to select whole grains and leafy greens when they are presented with all ingredients needed to make a meal, according to a new study from the Rudd Center for Food Policy and Obesity at the University of Connecticut. The study, published in Public Health Nutrition, was conducted in a “client choice” food pantry, meaning clients could visit once a month and select the foods they wanted from the shelves based on personal preference and family size. Nearly 40 million Americans face hunger and many rely on the food banking system to supplement the groceries needed to feed themselves and their families. Consequently, it is essential to maximize the nutritional quality of food available through food pantries. At the same time, it is also important to encourage food pantry clients to select healthier options. “We knew that pantries in our area were providing healthier foods, but we also understood that these items might need additional promotion for clients to select them. 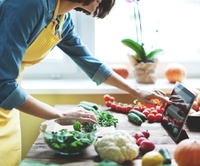 As we watched meal kits take off as a popular food preparation trend, we became interested to see whether a low-cost version could serve as an attractive and convenient method for increasing healthy food selection,” explains study co-author Emma Stein. For the study, a local chef developed two different low-cost recipes featuring whole grains and kale to create the meal kit. The pantry was open three days a week – one day each week both recipes were prepared for clients to taste, and all of the ingredients were available together in a bundle. Another day each week, the recipes were prepared and convenient to eat, but the ingredients were available only on the shelves as usual. On the third day, the pantry operated as usual – the ingredients were available on the shelves, but there was not a prepared recipe to taste. Findings revealed that clients were three times as likely to take kale and whole grains when they visited the pantry on days when recipe tastings and meal kits were available, compared to the days when neither was provided. In addition, including the meal kit with the recipe tasting doubled kale and whole grain selection when compared to providing the tasting alone. There also appeared to be a spillover effect from the meal kits – many clients selected additional brown rice and kale from the shelves, perhaps to prepare a larger portion. “Although providing recipes and tastings helps clients see how an unfamiliar food can be prepared, taking the extra step of putting together all of the ingredients into a bundle makes it that much more convenient for them to choose the healthier options that are offered,” says senior author of the study and Rudd Center Director, Marlene Schwartz. “If we can provide these products in a way that we know will increase their selection, we are giving each client and their family the best opportunity to eat healthier,” she concludes.